Sunday night's Emmy awards contained at least 34 direct and indirect references to President Donald Trump from host Stephen Colbert and the usual progressive crowd of winners and presenters. The Emmys took on a distinctly and unsurprisingly political turn early and never stopped. 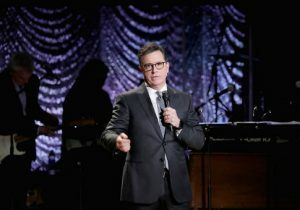 Colbert, whose "Late Show" fixation on Trump administration jokes has sent him to the top of the late-night ratings heap, started with a song-and-dance number that hit Trump for having Nazi fans and colluding with Russia. "The world may be the worst we've ever seen," he sang. "But it's never been better on your TV screen." The last four minutes of Colbert's opening monologue contained a flurry of Trump jokes, including poking fun at his television watching habits, how he lost the popular vote to Hillary Clinton, and, most memorably, setting up Sean Spicer's self-deprecating cameo to declare the Emmy audience the largest ever. Award winner and Trump impersonator Alec Baldwin said, "At long last, Mr. President, here is your Emmy," referring to Trump's desire to have won one for "The Apprentice." "Orphan Black" actress Tatiana Maslany suggested Claire Underwood, the fictional character from "House of Cards," would be a good president, saying, "she doesn't tweet." "We did have a whole storyline about an impeachment, but we abandoned that because we were worried that someone else might get to it first," actress Julia Louis-Dreyfus said upon winning her sixth Emmy for "Veep." Comedian Kumail Nanjani joked about the president's "worst nightmare" while presenting the award for Outstanding Reality Series. "They also celebrate people who frantically race across international borders and those who can scale walls really, really quickly. In other words, the president's worst nightmare," he said. There were plenty of times Trump was obviously on attendees' minds without his name being specifically mentioned. "Saturday Night Live" performer Kate McKinnon thanked Hillary Clinton for her "grace and grit" in her acceptance speech and HBO comedian John Oliver said his writers' jobs were actually harder because of how strange this period in history is, one of numerous references by the artists to "crazy" times. It was all very coy, and very low-rated.